In its early years, film was as much about learning something new as it was about witnessing something larger than life on an unusually big screen. Over time, world over, the learning bit has been compromised for the cinematic experience. If the over-reliance on dialogue in talkies sacrificed the visual grandeur of this primarily visual medium, then innovations in sound design made horror films a mainstream anomaly. Special effects, ironically, made Michael Bay the most successful storyteller of our times, so on and so forth. What we’re left with are remnants of what great storytelling used to look and feel like. Modern day audiences, at large, are unaware of what it’s like to surrender at the hands of the director, both emotionally and intellectually, and witness something that stays with you; like an arrow in the liver, as Ghalib would put it. The fondness for easy entertainment is even more dominant in our part of the world. The old world has almost fallen in Bollywood with producers, and sometimes even distributors, deciding on film content today. In Pakistan, it has been dead for ages. And the new order is in disarray: our film-makers today are just eager on putting a film out there just so that they can fund the next one. Amid all this urgency and confusion comes Mah-e-Mir like a full moon on a dark and cloudy night. Sarmad Sehbai and Anjum Shahzad’s masterpiece stands out among the plethora of ordinary Pakistani films by making the audiences participate in the very mystery it tries to resolve. By cleverly investigating an artist’s romance with his imaginarium in the presence of so many worldly issues, the film will surely become a reference point for both upcoming artists and screenwriters. Whether audiences would respond to the film with as much passion as an artist would, one cannot say. A similar discussion on ghazal giant Mir Taqi Mir’s obsession with the moon sets the tone of the film as various critics weigh in on this particular madness of the writer during a TV show. This doesn’t go well with Jamal (Fahad Mustafa), an upcoming poet who is watching the show in a coffee house and in a way similar to that of Jung, he questions this fixation with Mir by making a live call on the show and asking, “Why does Mir not see Neil Armstrong on the moon instead of fairy-like woman?” So begins a film that centres itself around the very concept of madness or vehshat, as the screenwriter interprets it, and uses it to propel debates such as that of the classical vs the traditional. Dr Kaleem (Manzar Sehbai), who leads that TV discussion, is the torchbearer of classics and a great admirer of Mir. He is the polar opposite of Jamal and, much like Jung and Freud, they too find some sort of salvation in one another, whether they accept it or not. The genius of Sarmad really comes out when a very literary debate turns into a discussion about the deconstruction of the present-day human condition and how it gets influenced by the surroundings. The consistent tug of war between reason and emotion is what makes the viewer relate to Jamal’s frustration. Mah-e-Mir uses indulgence in art as an escape from basic existential problems and the artist’s inability to balance the two. Although the solution it provides is a bit dark and gritty for a viewer who has so far been finding his or her catharsis in Pakistani serials, it is nonetheless very honest. On a side note, Manzar’s outlook, too, has stark similarities with Freud. Perhaps, even I am fixated. The real charm of Mah-e-Mir, however, lies in the fact that, running for a little over two hours, the film stretches but does not snap. All the visual references in the film, such as that of the halqa (circle), the coffee house, the old bookshop and even minor things such as the Rilke book, were justified within the context of the narrative. In terms of cinematography, it does rely too much on close-ups and at places the viewer is left wanting some breathing space, but even that works within the dramatic context of the film: it runs down emotions; hence, the focus on the faces. The film also carries a very important message for other film-makers: how to use flashbacks sparingly yet effectively. They didn’t seem repetitive and yet, always added some nuance to the narrative without compromising on its pace. Anjum and his actors deserve equal credit for anchoring the film firmly. Manzar meant every word he said and felt every move he made only because it was clear that he genuinely knew what he was talking about. Top that with a gruff vocal texture and you’ll have the best example of method acting in front of you. Paras Masroor as Jamal’s friend, Ally Khan as the ruler of the time and Huma Nawab as Kaleem’s ex-wife appear for a short period but make every frame ooze with their dilemmas. Mah-e-Mir is one film of recent times that has the right actors for the right roles, save for Sanam Saeed’s half-baked portrayal of Naina Kanwal. The problems with the film are both blatant and well concealed with the moon in the sky. Yes, the central issue with the film is the computer-generated moon, an aesthetic choice that eclipses all the curiosity built around its very existence. With its visual implausibility, the moon never becomes for the audience what it became for Mir. 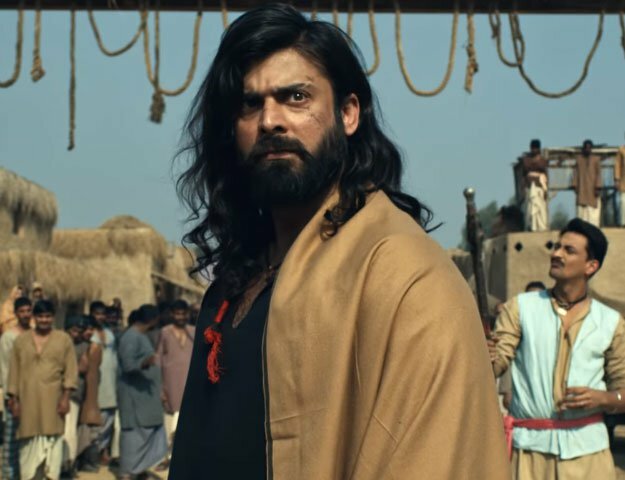 Although Fahad has proved with this role that he is the most versatile actor of the new lot, at places his recitation of verses and lengthy Urdu monologues seem a little amateur for a film that demanded total control and finesse. On the other hand, there were major issues of sound design as well. The attention-to-detail given to art direction was exactly what lacked with the sound design. And since the film seamlessly switches between two very different eras, a wide range of musical instruments and a variety of sounds could have been incorporated to make it more dynamic. And lastly, do not follow the subtitles. They are misleading and incomplete. This adds to another point: those who find it difficult to follow Urdu in its purest form might need some help from elders. Whether you give credit to her makeup artist or to her natural looks, Iman Ali has proved that she is an absolute stunner. Her on-screen persona coupled with the lilted dialogue delivery is bound to inspire. Even when her dance moves weren’t as smooth as that of her fellow dancer, Iman’s role as a courtesan has a lot more depth to it; her eyes speak of the dilemma of the woman who stands at the a crossroad of what she wants and what is expected of her. Between playing a woman who is so powerful that she can make or break a poet to playing a girl who has no will of her own, Iman has proved that, at the moment, she is the only complete package in Pakistani cinema. Music is one area where most Pakistani films have lacked in recent times. However, with Mah-e-Mir, both Shahi Hasan and Ahmad Jahanzaib have delivered one of the finest music albums of late. The songs not only stay true to the story but also add character to the film. Rajab Ali Khan of Azal fame gives a fresh take on Mir’s Yeh Dhoan Saand his husky voice and acoustic arrangement make for a treat. On the other hand, Piya Dekhan Ko by Shafqat Amamant Ali is a personal favourite for it brings back the Shafqat of the Fuzon days; a Shafqat who could sing as well with the harmonium as he could with a rock band. Shahi has come out of the closet in style and the grandeur of Piya Dekhan Ko will surely silence most of his critics.